As opposed to the Netlink, it's is actually based on the slower RCV144ACFW-P chipset(14400 bps maximum). 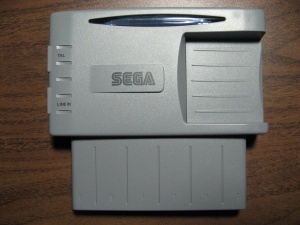 It also has some additional hardware to handle ISO 7816-compliant smart cards, 128 kb of flash ram, and two leds at the top to show some kind of status. The cart itself is about an inch wider and 1/4" thicker than the Netlink. It was bundled with an internet browser called "Sega Saturn Internet Vol. 1"(which looks oddly enough like a japanified Planetweb), some other disc called "Pad Nifty", and an X-Band version of the game "Virtua Fighter Remix". This page was last modified on 20 September 2010, at 03:49.